The 90’s weren’t just a great time for Texas country music to make a comeback of sorts. 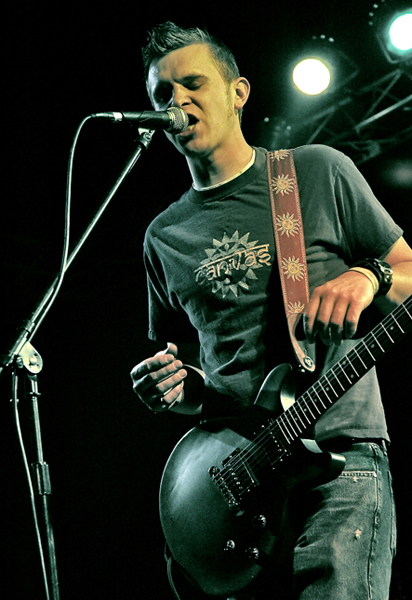 Alternative rock was blazing its own formidable trail on the heels of the Toadies. One such band that was a part of that movement was the San Marcos based Echo’s Orbit Room. At one point, the band was so popular in the 78666 zip code that I recall Blue October opening a show for them at Gordo’s. EOR is one of those great footnotes in rock history. They had it all. They were a can’t miss band. They had a mix of edge, hooks, chops and desire that made you feel certain they’d be selling out arenas one day. It was as if the grittiness and harmonies of Alice in Chains melded with the sonics of U2…on a garage budget. As the years wore on, they became keenly influenced by the burgeoning Texas scene and even cut some acoustic tunes that included banjo as the lead instrument. Led by frontman Jason Hoyl, a New Mexico native transplanted to Texas for college, their live shows became legendary for their incendiary nature. Hoyl’s expressive grimace matched his howling growl of a singing voice. He was as charismatic as they come and willed audiences to pay attention. Playing hard rock in the dives and honky-tonks of the hill country led him to always be ready to win the audience over. He was joined on lead guitar by Kris Aiken, already in his mid 30’s by the band’s height; he’d seen the pratfalls of the music industry and was cautiously optimistic about the band’s long-term success. On drums, was a cat named Bo Staples. Staples had picked up the drums as a child at the suggestion of a physical therapist to his parents in order to help alleviate some pain he was having. This led to him having a unique visual drumming style that I’ve never seen duplicated before or since. As the first decade of the 21st century wore on, the band wore out. Frustrated by close calls with record labels and being ever so close with not much to show for it, the last straw was when a deal fell through with Rick Rubin’s American Recordings. As they watched peers catapult to mainstream success and navigate rock fandom, they decided to call it quits after ten years of climbing the hill. Grown up responsibilities replaced debaucherous rock n’ roll dreams and the band scaled back to playing a few cover gigs just for fun. They shared the stage with all the rock legends of the day, had a residency down on 6th street, served as the backing band for a number of singer/songwriters out of Austin and San Marcos and yearned to add a fiddle to their show somehow after sharing the stage with Reckless Kelly. EOR influenced more bands and musicians than they’ll ever know and helped keep the lights on at a number of San Marcos and New Braunfels area venues when they were the only drawing game in town. For those reasons and many more, they are a Galleywinter Texas Treasure. Their last show was at the Greenfest pre-party in 2008…but their music lives on. You actually make it appear so easy along with your presentation however I in finding this matter to be actually something that I believe I’d by no means understand. It kind of feels too complex and very large for me. I am looking ahead on your subsequent submit, I¡¦ll attempt to get the dangle of it! Thank you for sharing superb informations. Your website is very cool. I’m impressed by the details that you have on this blog. It reveals how nicely you perceive this subject. Bookmarked this website page, will come back for extra articles. You, my pal, ROCK! I found simply the info I already searched all over the place and simply could not come across. What a great site.